Everyone has dreams, but how many of us are willing to leave our home country and friends and family at age 15 in order to pursue them? It’s a big leap into the unknown, a leap that last summer’s second round draft pick by the Capitals, Martin Fehérváry, was willing to take. Leaving Slovakia at a young age to reach the ultimate goal, of being a pro player. Anze Kopitar, David Pastrnak and Jakub Vrana. Besides being NHL hockey players, what do they have in common? They are all central European players who were willing to leave everything, for playing junior hockey in Sweden. A trip that has turned out well for them and a lot of other players in the past. Their journey has inspired a lot of younger players to do the same, and Martin Fehérváry is one of them. In 2014, the young Slovakian left his hometown of Bratislava for Malmö, in the southern part of Sweden. It all went fast for Fehérváry in Malmö, at only 15 years of age. After arriving, he quickly established himself with the U18 team in the organization, playing only 12 games for the U16 side. Later that year Martin was selected for the U18 national team. The following season (15/16), he was promoted to the U20 team in Malmö, the highest junior league in Sweden. Later that year, Fehérváry made his debut in the Swedish Hockey League (SHL), at only 16 years of age, becoming the youngest player ever in Malmö to represent the team in the SHL, and the youngest foreign player ever in the league, overall. The team didn’t hurry to play him regularly though, and that year Fehérváry only played in four games for the senior squad. He was also a regular on the national team, at both the U17 and U18 level. The following season Martin was selected for his first World Junior tournament, the first of three in total. In order to get the best development, playing against senior opposition is key. After playing in only nine SHL games for Malmö in the 16/17-season, Fehérváry decided to leave the organization, for second-tier team IK Oskarshamn. A team willing to give him the playing time he needed. The team kept their promise and Fehérváry did his part, playing really well the following season, as Oskarshamn reached the qualification stage to SHL, and had one of their best seasons in team history. At this time, you could start to see the type of player Fehérváry was, a fast-skating, defensively sound player, who wasn’t afraid to use his body. Not necessarily the offensive virtuoso, but more of a two-way player, with his biggest strength on the back-end of the ice. His season in Oskarshamn echoed all the way back to Slovakia, and at 18 years of age he was selected to the Slovakian World Championship team. The 17/18 season was a breakthrough for Martin, in perfect timing for the upcoming draft. Most experts and scouts were agreeing that Fehérváry would go somewhere in the draft, but no one really expected him to go earlier than the fourth round. The Capitals were thinking differently, and decided to pick him early in the second round, with the 46th overall selection. 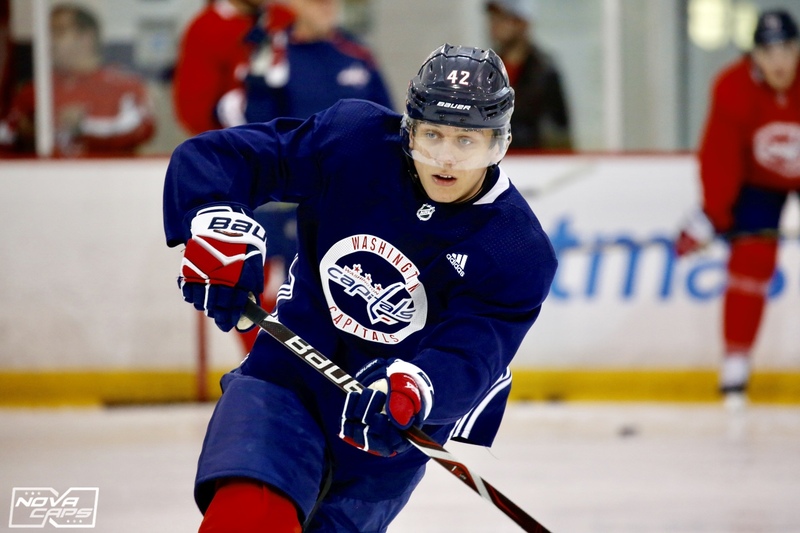 Already at development camp with the Capitals, Martin proved his worth and a week later inked a three-year entry-level deal with the organization, completing another step in his journey, at only 18 years of age. Before signing the deal, Fehérváry had already signed with the SHL team HV71, to which he was loaned to right-away from the Capitals for the 18/19-season. HV71 was keen on bringing in Martin, after seeing his good spell with IK Oskarshamn, and didn’t hesitate when the opportunity presented itself. The team has previously done well with younger players, producing and developing talent like Vegas prospect Erik Brännström and William Karlsson in recent years. I have seen every game of Fehérváry’s this season as a season ticket-holder for HV71, and I’m impressed. He has (when this was written) produced five points in 32 games, which isn’t that impressive per say, but like I’ve mentioned earlier, he isn’t the type of player we could expect ending up to be the next John Carlson. His offensive play isn’t bad though, he has a good first pass and is joining the rush more and more frequently in the offensive zone. What really sticks out when you watch Fehérváry is how he treats every situation at 100%, he never backs down and isn’t afraid to go where it hurts. Also, the man is quick on the blades and can follow most speedy wingers that try to beat him to the net. In the defensive zone he is very good at shutting the opposition down, which is underrated in today’s hockey, in my opinion. To just remove people cleanly, not causing penalties. When it comes to underlying stats, Fehérváry has good numbers this year. Currently his corsi rating is 54,10%, meaning that the team produces more shot attempts then what they receive back when he is on the ice. In total, you can’t say that he is a spectacular player in that way, but rather the reliable player you want on the backend. If you were to compare him to anyone on the current Capitals roster, I’d say that he reminds me of Michal Kempny. To reach the next step, Fehérváry needs to improve his offense, but I’m confident that will come. We need to remember that he is young, and already plays against men. If he picked the Junior route, playing in the WHL or such, the stats sheet probably would have looked different. The SHL is also a rather defensive league and points per game players usually are few. After having a coach switch earlier in the season, Fehérváry has gotten more playing time and it will be exciting to see how he finishes the season. If it ends with another World Championship tournament with Slovakia, I wouldn’t be surprised. All and all, I have a good feeling about this player. I like how he at every stage in his career hasn’t settled, he has always had his personal development in mind. Leaving a SHL team and the glamour that comes with it, for getting extra playing time in a small town in the deep Swedish forest shows his dedication and character. With the right seasoning, I could see him being a good fit in the Caps roster in a few years. Especially with the quick adjusting that he previously has had in his career in mind, maybe it could be sooner rather than later. This entry was posted in News and tagged Capitals Prospects, Caps Prospects, Jesper Svensson, Martin Fehervary, Washington Capitals Prospects. Bookmark the permalink.